South Korean electronics giant, LG has been launching a lot of mid-range and budget smartphones of late in its homeland South Korea. And the next one on the list is the LG Stylo 4, which will be the successor to LG Stylo 3. The Stylo 3 was launched in May 2017 and the Stylo 4 spec-sheet leak confirms the launch of the smartphone is around the corner. The LG Stylo 4 is confirmed to come with a 1.8GHz processor, which could be the Snapdragon 450 chipset as the LG Stylo 3 series featured the Snapdragon 435 chipset. Other leaked specifications include a 6.2-inch 18:9 display on the front, 2GB of RAM and it boots Android 8.1 Oreo out of the box. The LG Stylo 4′ spec-sheet says the phone will come with a 6.2-inch FullVision display on the front with 18:9 aspect ratio. However, the resolution of the screen was not revealed. The phone will have a 1.8GHz octa-core processor under the hood, which will work in tandem with 2GB of RAM and 32GB of internal storage. There could be a 3GB of RAM and 32GB of storage option too. The storage can be expanded up to 2TB with a microSD card. The device boots Android 8.1 Oreo-based LG UX out of the box, and it will have a single 13MP camera to the back. LG is also said to add a 5MP shooter on the front of the phone. As the name itself suggests, the LG Stylo 4 will come with Stylus support, same as its predecessors. Also, the front-facing camera is revealed to be a wide-angle camera, and the phone will have a 3300mAh battery inside it. Connectivity options in the smartphone include 4G LTE, VoLTE, Wi-Fi 802.11 b/g/n, Bluetooth 4.2, GPS and a micro USB port. The phone weighs 170 grams. There’s no launch date available for the LG Stylo 4 smartphone, but it could be unveiled in South Korea first before making its way to other Asian markets. 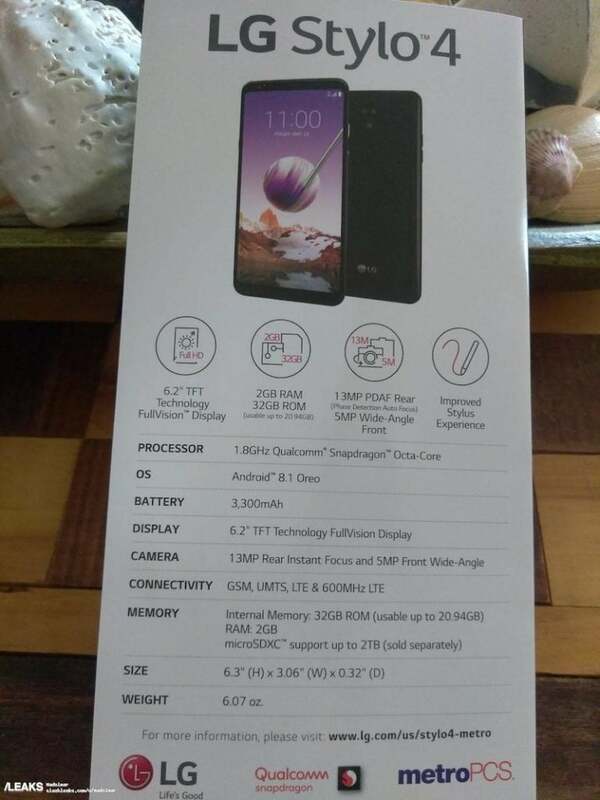 In other news, LG is expected to launch the G7 ThinQ smartphone in India later this month.